Like many people I picked up a love of books in college. If I have a materialistic streak it comes out with books. I buy lots of books. The main struggle I have is keeping my buying in pace with my reading. 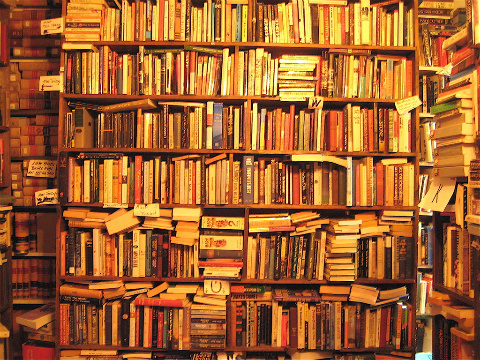 When I was younger I was simply trying to acquire books to build a personal library. So I just bought books. Way more than I could read. Simply having the books made me happy. That's the materialistic aspect I struggled with. The craving to own and acquire the books as physical objects. I'm more disciplined now. 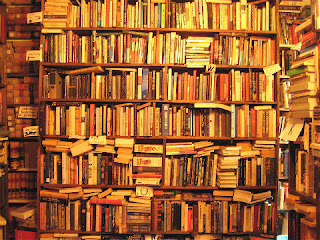 I typically have a large "to read" stack, around 5-15 books on a specific shelf in the bedroom. And when the shelf gets full I work hard to stop buying until I get some of those books read and moved off the shelf. A part of the struggle in limiting my buying is simply how much I love bookstores and shopping for books. Especially used bookstores. I've joked with my sons that if I have a natural posture it's tilting my head to the right so I can read the spines of rows and rows of books in used bookstores. I adore huge, sprawling used bookstores. Whenever I visit a town or city "bookstore" is the first thing I type into Google maps. If you have a used bookstore in your town I'll be in it, head tilted to the right, scanning the stacks. A huge part of the fun of shopping in a used bookstore is the thrill of discovery. It's the same thrill Jana gets shopping for clothing at thrift and consignment stores. The lure of the hunt and finding something totally unexpected and awesome for an amazingly low price. So what do I hunt for in used bookstores? The main thing is titles I've never seen before. If you go to chain bookstores the titles get pretty predictable. I can pretty much tell you what is on the shelf right now of your local Barnes and Noble. To keep a Barnes and Noble interesting you can't go into one but one or two times a year. If you visited a Barnes and Noble every month you'd quickly become bored as the selection doesn't change that quickly. Which is why you prefer the used bookstore. The stock is totally unpredictable. And most importantly it will have older and out of print titles that aren't on the shelf of the chain bookstore. Those titles are waiting there for you to discover them. The other thing I look for in a used bookstore is something that might be collectible. I'm not a huge collector and my tastes are quirky which keeps the prices down. For example, if I found, say, a first edition copy of a William Stringfellow book at a used bookstore I'd be excited about that. But no one else cares all that much so that book might be $10, which is easy on the pocketbook. So I have a few first edition copies in my collection. Here are some of my prized possessions. A first edition of George MacDonald's The Hope of the Gospel (a gift from my friend Chris). Autographed and first editions from William Stringfellow and Will Campbell. I have a first (American) edition of Dietrich Bonhoeffer's Letters and Papers from Prison (published first in the US under the title Prisoner for God). I also have many first editions of Thomas Merton. Most of these books were inexpensive. Most of them found scanning shelves in used bookstores. I have, however, gotten into buying autographed copies which is best done online. I like to collect autographed copies from authors who have greatly impacted me. That's why I have the autographed copies of Stringfellow and Campbell. Along these lines the most expensive thing I've purchased is a first edition copy of Loaves and Fishes signed by Dorothy Day. That book was $120 and I got it as a birthday present. Now, if you start looking for rare and collectible books, first editions and such, every used bookstore becomes the possibility for the Great Discovery. We've all seen and heard stories about such discoveries. Someone finding something really rare and valuable sitting in a junk heap at a garage sale. That's the dream of a collector scanning the stacks in a used bookstore. The possibility of finding something really rare and special sitting on some dusty shelf. And that happened to me just the other day. I made my great discovery. I've always wanted a book signed by Thomas Merton to sit next to my signed copies of Dorothy Day, Will Campbell and William Stringfellow. They all knew and corresponded with each other. Day, Campbell, Stringfellow and Merton. These are the radical Christian theologians who, outside of George MacDonald, have most greatly impacted me. And they were all friends. And so a signed book by Merton was the book missing from my collection of these radical friends. But sadly, given his fame and the rarity of his autograph (Trappist monks don't do book signing tours), Merton's is the most coveted signature of the lot. Over the years as I've searched Abe Books I've found that books signed by Merton are just way out of my price range. Right now, as I did another search, prices for signed books by Merton go from $750 for a signed eighth printing of Seeds of Contemplation to $8,550 for a signed first edition of Seven Storey Mountain. Prices for other signed first editions range from $1,000 to $2,700. So I knew I was never going to get a signed copy of a Thomas Merton title. I was in a used bookstore yesterday, head tilted to the right, scanning the stacks in the Christian section. And as I was scanning the M authors I found the collection of Merton titles. I knew all the titles and had many of the books already. But then I saw an older copy, still in its dust jacket, of Conjectures of a Guilty Bystander. This is one of the last books published by Merton before his death in 1968, a collection of essays and reflections on a variety of topics. The book looked old enough to be a first edition, so I pulled it down and opened it to find out. My heart jumped. It was a first edition copy and the book had been signed by Thomas Merton. I looked up at the price penciled in at the top. The bookseller knew it had been signed, pointing this out to me as I checked out. The book, the seller said, had come from the collection of the late Bishop Murphy (1915-2007) who had been the bishop in my hometown of Erie. As you can see, Merton signed the book for then Monsignor Murphy. 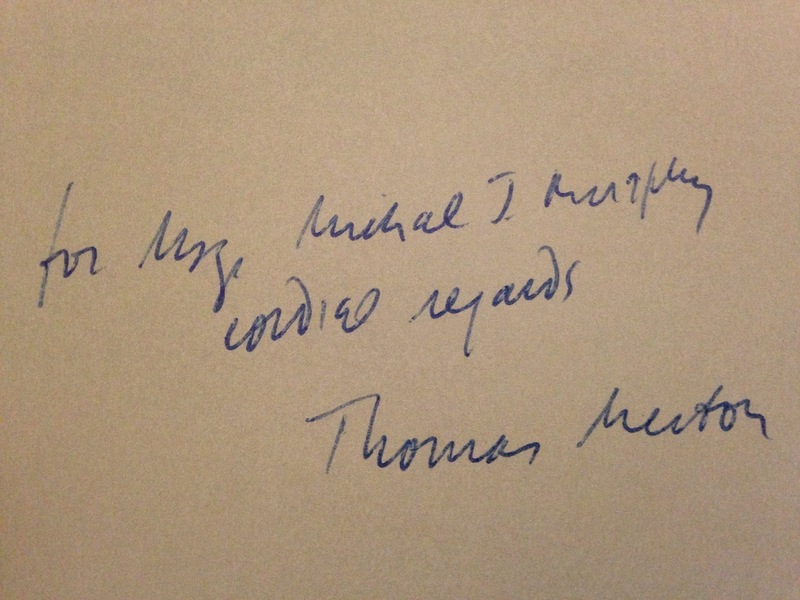 The bookseller commented that it was neat that Merton had signed the book. I don't think the seller knew a lot about Merton. I have no idea how much a signed, first edition copy of Conjectures of a Guilty Bystander costs. But I wholeheartedly agreed. It was, I said, very, very neat. Oh, my!!! How happy I am for you!!! Not only signed, but one of his best. The back of my copy of CONJECTURES OF A GUILTY BYSTANDER is held together by black duct tape. I'm pulling it from the shelf often, nearly every week. Its shabby book mark has been marking my place for twenty years. It is one of the books that I wish I could put into the hands of every evangelical minister and leader. They would never be the same afterward. They may not admit it, but it would never let them rest. Hee. My first thought, while scrolling down to comment, was "Oh. My!" check out Recycled Books in Denton, FANTASTIC. That is awesome, a real-life treasure hunt success. I feel the same way about old, first edition books. Something so special about that original print. I once ordered a very obscure book for about $4 on Amazon called "A Wandering Jew in Brazil," being the autobiography of a 19th century missionary, Polish convert to Christianity named Solomon Ginsburg, expecting a ratty little 1980s paperback 3rd edition. Sure enough, in the mail arrives a brown and green, dusty, weathered original first edition printed in 1921. Epic. I was heartened to read this. I know the head tilt, the heart jump, the problem of too many unread. I have two local friends with the same affliction. Our habit is to travel to Friends of the Library sales in our area. Most people think we are ridiculous, which I guess I can't dispute. So, nice find -- I've never seen a signed Merton. Oh, and great job on Slavery of Death. I've used it in my preaching (I pastor a small church). We have The Green Apple here in San Francisco, Powell's Used Bookstore up the coast in Portland...but my favorite is Hay-on-Wye where the entire town sells used books and I was able to purchase John Parkhurst's Greek Lexicon published in 1812. First, you can explore my book reviews of Stringfellow's books on the sidebar of the blog. I quote extensively from his books. Look for The William Stringfellow Project on the sidebar. But if you were buying a book to start with I'd start with Free in Obedience. I think you were blessed by the spirit of Merton! it's a bona fide miracle! Is there any kind of ethical question in buying something at the seller's price when you know it is much more valuable than the seller realizes? I did think about that. Under the $10 price the seller also wrote "signed." So the seller was aware of the signature when it was priced. And we did have a conversation about the signature. So my main worry was alleviated, that the signature had been missed when the book was priced. As to what the volume is worth, I have no idea. I know the prices online for signed copies are more than I can afford, but I have no idea if those prices are remotely reasonable.